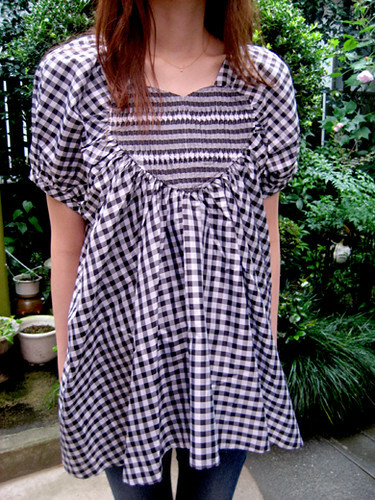 I got a silk gingham blouse from TSUMORI CHISATO. 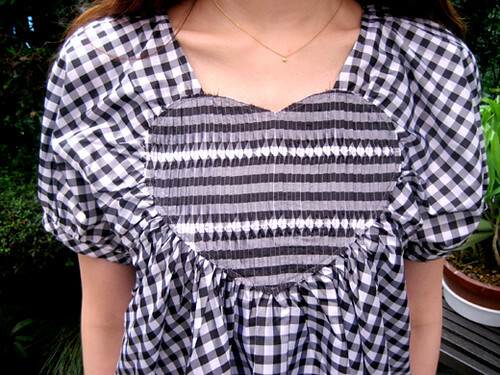 The heart of gingham blouse makes a lovely accent which completes adorable look. It makes me cheerful at all times. Your comments always mean so much to us and please know that your comments are always welcome! Thank you so much for following our blog. Well, I don’t think that I have any special reasons to get Tsumori things…just because I luv them. that’s all. Other fav brands are Paul & Joe Sister,Milk Fed,FREE’S SHOP…You’ll see all of them here too. I’ll keep a look-out for your posts of other brands! Don’t know how they escaped me, I was distracted by all the sweets! Nah, just kidding. Fans of TSUMORI CHISATO not only include takako but also all of us, the staff. takako buys and blogs about it the most so it only looks like she’s the only one buying. A lot of TSUMORI’s clothes really show that it is a very Japanese brand. TSUMORI CHISATO is a highly respected designer and she is always an inspiration for girls in Japan.